In March 2011 the National Library placed a dataset of our sheet music collection up at data.gov.au. This was to be used as one of the datasets for the LibraryHack competition. 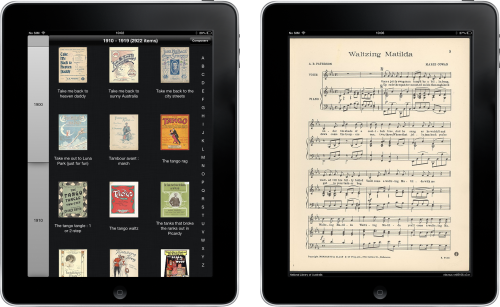 The dataset contained around 11,000 items from our sheet music collection, all the metadata, all the details about every page within each piece of sheet music and most importantly references to each image of the digitised page. This was a bit of a handcrafted dataset. Our regular API’s, like the Trove API, will only return information for the “top level” of the item, not the lower level details of every page. We didn’t quite know what would happen with the dataset & how it would end up being used in the competition. Unfortunately it didn’t really get used in a major way in any of the entries and the dataset sat there gathering electronic dust. Nearly 12 months later, totally out of the blue, someone walked into the reading rooms at the library, approached the person on the desk (who, as luck would have it was Sarah who was the project manager for our iPhone catalogue app), introduced themselves and said “Hi, my name is Jake & I’ve built this” & showed off what was the first prototype of what went on to become Forte. At the time Jake was looking for a large dataset to help him solve a problem he was working on. He found our sheet music collection & built a proof of concept that helped him to solve his problem. Jake spent a lot of time at the Library working (and using our free wi-fi) and never realised that we had such an interesting collection. In approaching the library he wanted to find out what we thought. He had taken it as far as he could, but wanted some advice on how to take it further. Over time, the Library worked with Jake to fine tune the app. The app initially started as an A-Z list of 11,000 items. We broke it up into decade by decade & attempted to show how many items were contained within each decade. We also added a feature to be able to limit it to display who were the active composers within each time period. One thing we decided quite early on in the discussions was that there was to be no search. This was to be a discovery tool that displayed everything. We wanted people to explore. The final app really has kept the core of Jake’s initial idea. It was refreshing to see someone outside the Library who was unfamiliar with the collection, navigate it & pull out the meaning of what was important and didn’t have preconceived ideas of how a collection had to be accessed. Likewise it was great being able to work with Jake & get the benefits of how he had approached similar problems within other non-library projects. In keeping with the initial goals of making the data openly available, the Library has released the source code to the app under an open source license. Others can build upon what we have done. If you can, guide the developer to help them fine tune their product & give them insight into the intricacies of the data. It was one of those perfect examples of everything falling into place with the right people being in the right place at the right time. Forte is available now at the AppStore. I’m really excited about the story of how the app came into existence, our team that worked alongside Jake to take his idea & build something that I’m really proud of. I hope you enjoy discovering our collections. This entry was posted on Tuesday, March 26th, 2013 at 10:26 am	and is filed under Libraries, Museums, Music, Work. You can follow any responses to this entry through the RSS 2.0 feed. Both comments and pings are currently closed. Any plans for an Andorid port? I think it is an amazing concept. Great job Jake!